I'm pretty sure this figure must have come from Reaper's first Bones Kickstarter, because they had real trouble with facial features not filling out properly in the mould on a number of the miniatures. This is one such. In Reaper's catalogue, this is 80003: Ellen Stone, by Bob Ridolfi, but I always call her Jenny No-Nose because, well, she has no nose. Rather than try to fill in her missing features with paint, I've just painted her with a flat rag-doll face with no eyes or nose and just a gash for a mouth. She's a Weird West gun-babe. Next up on the Bones-painting production line is this one, 77261: Bat Demon by Bob Ridolfi. At first I was going to paint him classic devil red, but I went with green in the end to give it a more serpentine look. I don't know why I wanted that; there's nothing very serpentine about the sculpting, but there you are. The heart has its reasons. The wings and elevated position make this figure a bit more imposing than its stature actually warrants. As far as its body goes, it's just very slightly — if at all — larger than the average Reaper bloke. Here's another of my vast stash of Reaper Bones figures, now splashed with paint. This is a very quick and unfussy paint job, and not really a very good one, but it will do the job. It took me about half an hour. 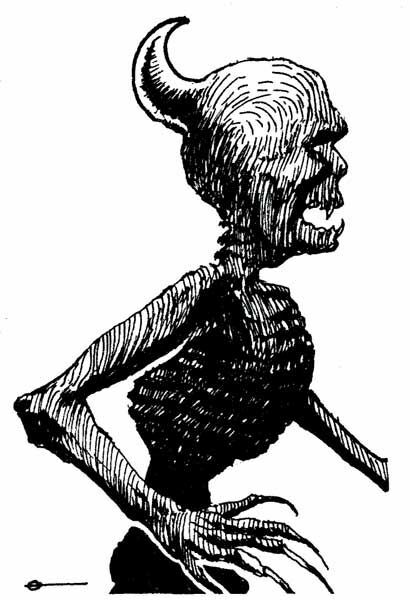 It appears in Reaper's inventory as 77258: Blood Demon, but it seems pretty clear that it's based on a D&D minor demon called a Babau that I first saw in the MM2, published in 1983. 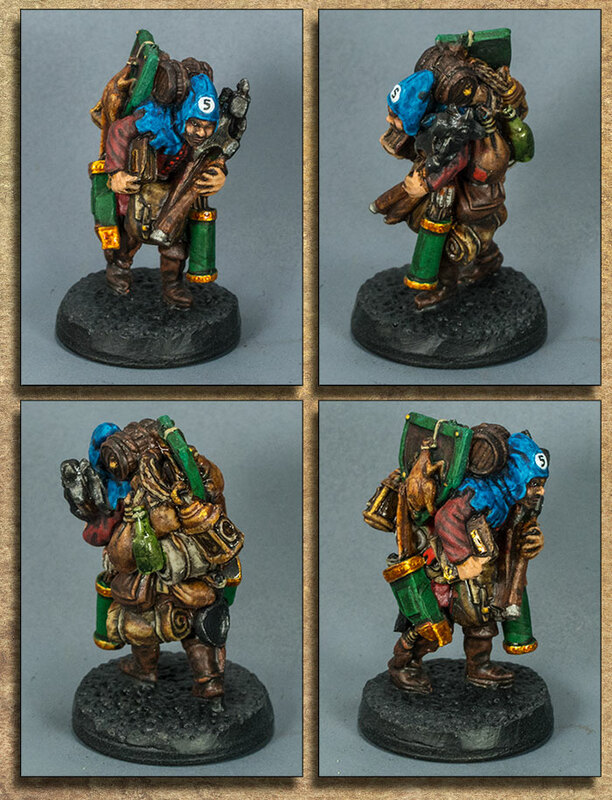 I've painted this figure before — I got two of them in one or other of the Reaper Bones Kickstarters. Both of them ended up with decidedly unhappy facial expressions, but of the two this is the one that looks the least trustworthy. He really seems to be holding a grudge against his exploitative employers, and no wonder. 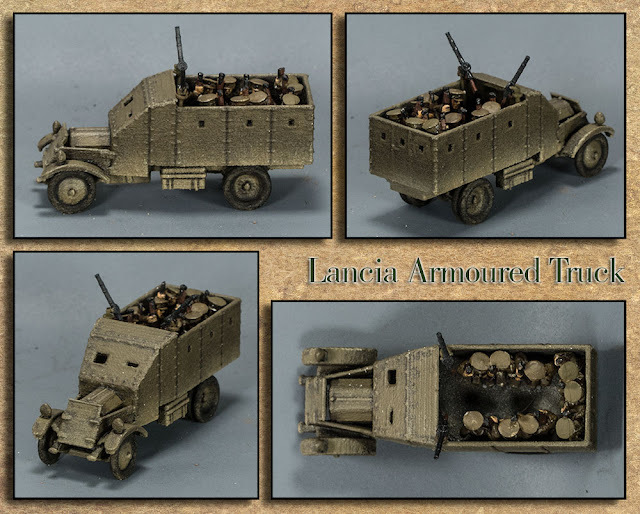 This is my 3d printed 1:100 scale (15mm) Lancia armoured truck, a WW1 vintage vehicle that served on until the late 1920s. I've crewed it with WW1 British seated figures from Peter Pig, though I've had to amputate all their legs below the knee to get their heads down below the parapet. The Lewis guns are another of my 3d printed models; they're probably a little fragile for the rough and tumble of the wargames table, but we shall see. These are some 15mm WW1 German stormtroopers I picked up a while ago when Battlefront were having a sale to clear out their WW1 stock. I'll be using them mainly as Freikorps, since the interwar period is my usual stomping ground rather than the Great War. The coloured blobs are glass beads that I use to indicate the figure's weapon load, to ease identification for my decrepit old eyes: red for LMG, orange for SMG, pale blue for pistol, purple for portable anti-tank (ATR, PIAT, Panzerfaust etc.). I used to also use white beads for rifles, but since that's the default weapon for the period I thought it was a bit of a waste of time. So now I only indicate anything that's not a bolt-action rifle. 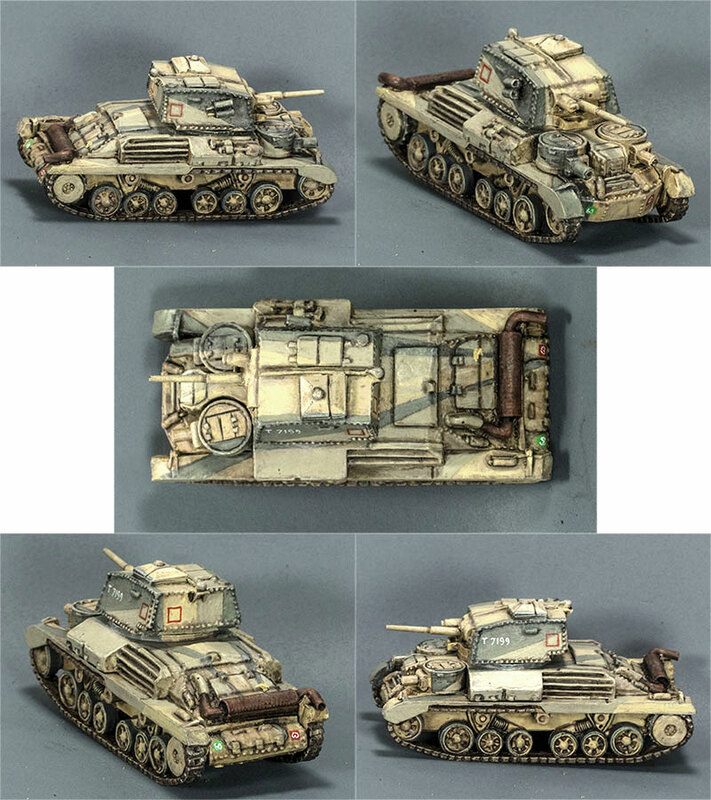 I repainted one of my old 1:100 scale (15mm) Battlefront A9 cruiser tanks in the Caunter camouflage pattern that the British used in Greece and North Africa up until the end of 1941. It's an interesting camouflage scheme, and one which I am quite likely to never, ever paint again unless I can work out some less tedious way of achieving it. I thought I would be able to just mask and airbrush it, but all the surface protrusions made that a nightmare — maybe it would be less troublesome if I could have painted all the components separately and then assembled them. Anyway, for this one I just ended up doing it freehand. NOTE: this is Battlefront's original sculpt of the A9. They've remastered it since then and added a bit more detail. Nevertheless, I think this old one is a pretty decent representation of the original vehicle. Something that irks me slightly about Bolt Action is that there's no real mechanic to reflect battlefield concealment or stalking. If you can draw a line of sight between one model and another, then they can see each other plain as day. Cover helps your troops to avoid being hit when fired at, but it does nothing to impede target acquisition in the first place. 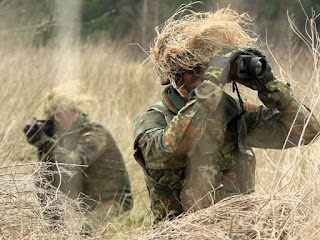 Before one unit can shoot at another, they first have to acquire the target by passing an Orders Test (though if they fail, they don't suffer the usual consequences of failure, they just fail to see the target). If a friendly unit in line of sight of the acquirer shot at the target within the last turn (+1). Once a unit has acquired another, they maintain acquisition until either they or the target moves out of line of sight. A unit in line of sight from another, but not yet acquired, can declare itself to be attempting concealment. Concealment has no effect except to hinder acquisition by an enemy unit. Large vehicle or gun (tank, 17 pdr, 88mm) -3. Regardless of penalties, the minimum score is zero — no matter how incompetent your troops, they're not going to become more obvious by trying to hide. Infantry and man-packed crew weapons can still move up to 3" while attempting concealment, but it will make it easier for enemies to spot you (see above). Vehicles of any kind must remain stationary to be concealed. Concealment is lost as soon as the concealed unit opens fire, and may not be regained without moving to a new position at least one Run move away. 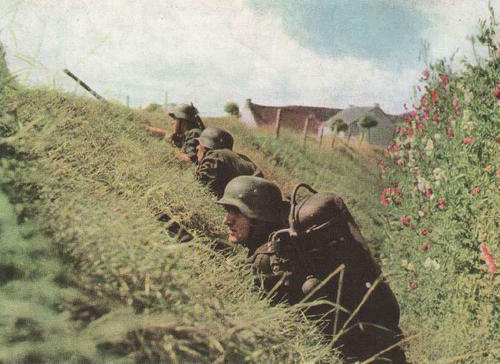 A veteran infantry unit, Down, in cover, and concealed is going to be quite hard to spot, but as soon as they open fire they'll lose the benefit of their sneakiness. 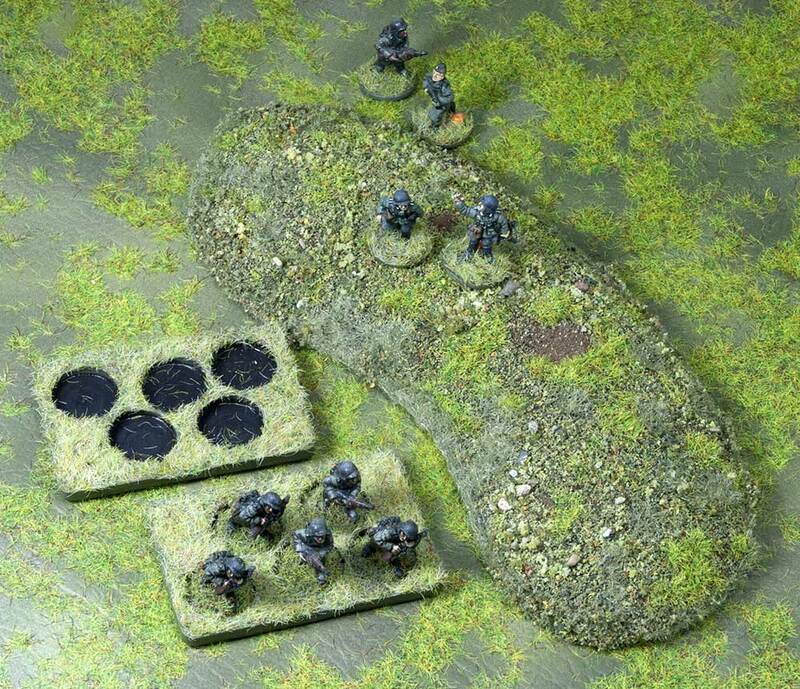 These were the very first WWII 15mm figures I ever painted. I bought them when Flames of War was brand new and exciting, and based them for that system, but I became disenchanted with FoW — partly due to its own shortcomings, but mostly because of the way those shortcomings were being gamed by people who were obsessed with winning rather than having fun. Anyway, I haven't played FoW for many years. Here they are as I originally based them. Empty sabot base behind a full one. Little flocked plugs can be used to disguise empty sockets. 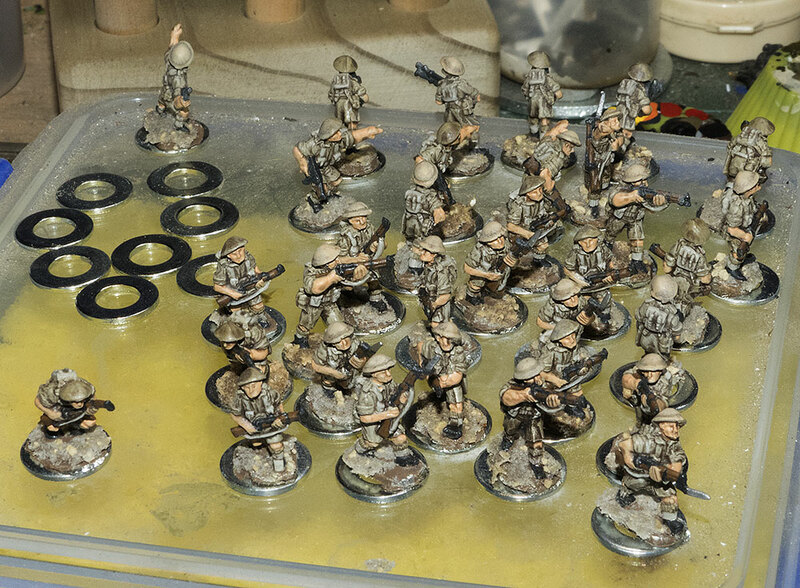 My current practice is to base figures individually on 12.5mm (½") washers, and then to use MDF sabot bases if I should ever need to use them for something like Crossfire or Flames of War or whatever. What I'm playing most regularly these days is Bolt Action, which is not without its own flaws, but then again, what rules are not? Where the washers fall down for basing is when I'm dealing with individual prone figures. 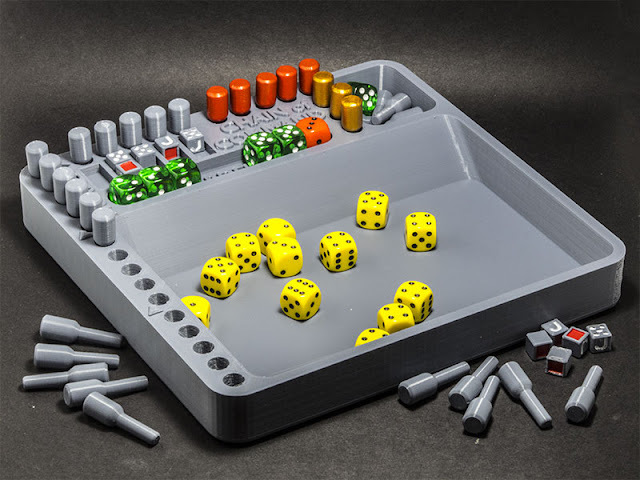 They don't really fit elegantly on a ½" washer, and larger washers extend out too far sideways, not to mention being too large for my MDF sabot sockets. I haven't yet come up with a really satisfying solution to that issue, and I'm currently sidestepping it by avoiding using individual prone figures wherever I can. Here's my 1/285 scale model of the Vickers Medium Mk.II*, printed by Shapeways in FUD resin. 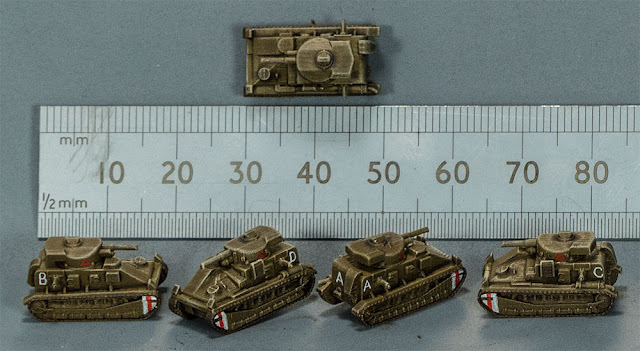 It's available as a sprue of five vehicles at http://shpws.me/Mv2T. This is the little Carden-Loyd Medium Machine-Gun Carrier Mk.VI, used by the British army and produced from 1927 to 1935.